Once you master the basics of personalization, you can use your data to identify customer segments who frequently get overlooked in standard segmentation models and then create messages or programs to appeal to them. 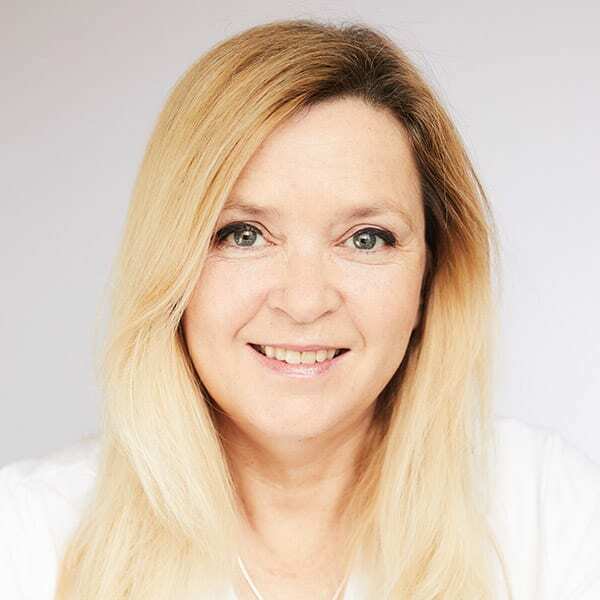 This more sophisticated messaging strategy serves two purposes: First, these targeted messages will be even more relevant and useful to these special groups of people. Then, those higher-value messages can spur them to act in ways you want, generating conversions and revenue you might have missed. You’ll find these potentially valuable segments in four stages of your customer lifecycle. Who they are: These people visit multiple pages on your website, such as product pages or FAQ and support sections. They might even start a process (put an item in a cart, begin to register for an account or event, start a download or an information request) but never complete it. Where are they going on the site, and what pages do they visit most often? What do first-time purchasers usually buy, and can I point my non-buyers toward those purchases? How to move them to action: Make them more confident about buying. 1. Look for and correct conversion barriers. Where do browsers usually break off the process? You might discover your checkout or registration pages need repair or reconfiguring to reduce complexity. If they jump ship on pricing pages, you might need to upgrade your content to show the value and benefits. Post a link to targeted and specific information, not just a general FAQ page. Offer a downloadable buyers’ guide, a live chat module or a chatbot. Link landing page that addresses specific issues or helps browsers compare different products or plans. 3. Establish an automated “first purchase” program. This series of personalized messages mixes your shoppers’ browse data with general content to nudge them toward making that first purchase. Quiksilver targets men with recommended hoodies in this promotion. Segment: People who buy for the first time using coupons, discounts or other promotions. Who they are: They might be the folks from your abandonment segment who finally bit on a choice incentive you dangled in front of them. Or, they’re new subscribers redeeming an opt-in incentive or searchers who used an exit-intent popover on your home or product pages. These segments for post-purchase and upsell campaigns will often be a large percentage of your customer database. Which incentives do first-time buyers use most often? Do incentive users eventually become higher-value customers? Will a first-time shopper buy again when offered another coupon-incentive? How to move them to action: Approach these new customers carefully and communicate your brand value while making them feel welcome. 1. Test different incentive values. These could be different percentage-off or money-off discounts, gifts with purchase or some other added-value offer to see if you need a greater discount at the top of the funnel (low intent) than at the bottom (high intent). 2. 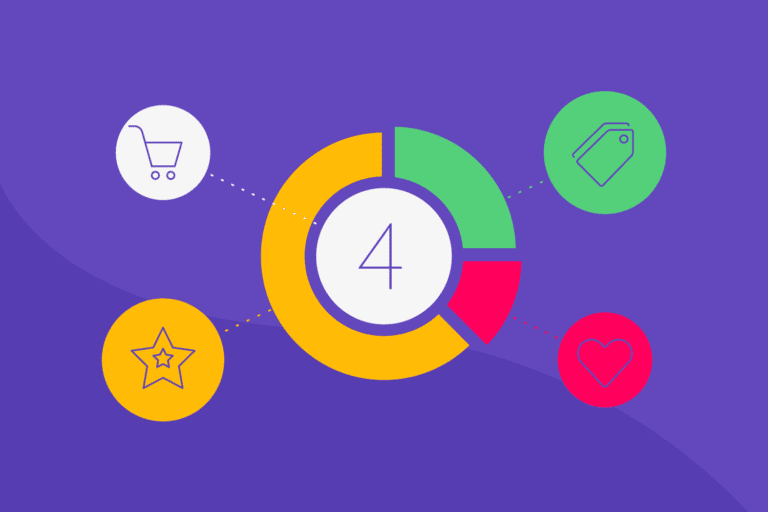 Measure and track discount/incentive-driven shoppers for lifetime value. Compare them with first-time shoppers who pay full price to see which segment is more valuable over a set period. For example, do discount shoppers buy more often than full-price shoppers? This could give them a higher lifetime value. 3. Track discount shoppers for conversion to full-price shopping. You don’t want to train shoppers to wait for discounts every time before buying. Track your discount-using newbies to see whether they buy a second time and whether they pay full price on that purchase. This data will help you make better long-term decisions about discounting and incentives. 4. Implement a “second purchase” program that uses exclusive content and other non-discount incentives to buy again, this time at full price. Remind them about your value or unique selling proposition by using social proof, as in this example from FatFace. FatFace incorporates customer reviews to promote popular styles. Who they are: They’re your customers who spend more than anyone else, either because of value or because of the frequency of purchase. 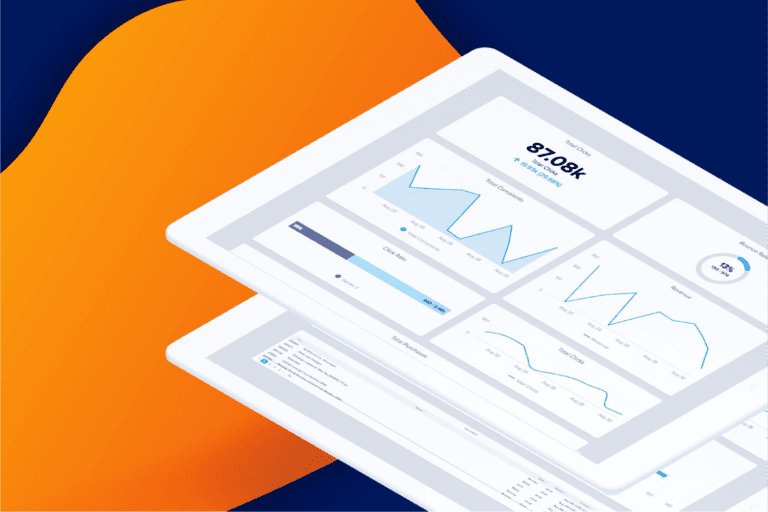 They could make up 20% of your database (according to the Pareto Principle), but they probably drive 80% of your revenue. How you identify them depends on your business model and goals. You could use historical lifetime value, order frequency, value and variety, or full-price versus discount-hunters. How did I acquire these customers? Which of these characteristics can I use to make them feel appreciated, encourage them to increase their AOV and become brand advocates? Which campaigns drive them to act? What do they buy most often, and do they buy at full price or with discounts or incentives? How to move them to action: You don’t have to persuade these customers to buy—you must persuade them to buy from you and not your competition. If your messaging reflects their VIP status, you’ll give them more reasons to shop you first instead of waiting for happenstance or chance to bring them back. 1. Review your acquisition sources. If you find they’re more likely to come from a specific channel, increase your budget for that channel. 2. Set up loyalty programs for the products or categories that your top spenders buy most often. Personalized emails can promote the program and reflect your shoppers’ behavior, budget and buying habits. Include educational or lifestyle content that reinforces and expands their loyalty to those products. 3. Create a “members only” set of perks and privileges for your top shoppers regardless of product or category preference. Choose perks that are most relevant to your brand or likely to trigger added-value purchases, such as free express shipping, member-only discounts and freebies, advance access to sales and special events, concierge services, handwritten notes from the CEO and rewards for achieving higher spending levels. The Shell Fuel Rewards program awards VIP status to customers automatically when they reach a set spending level. 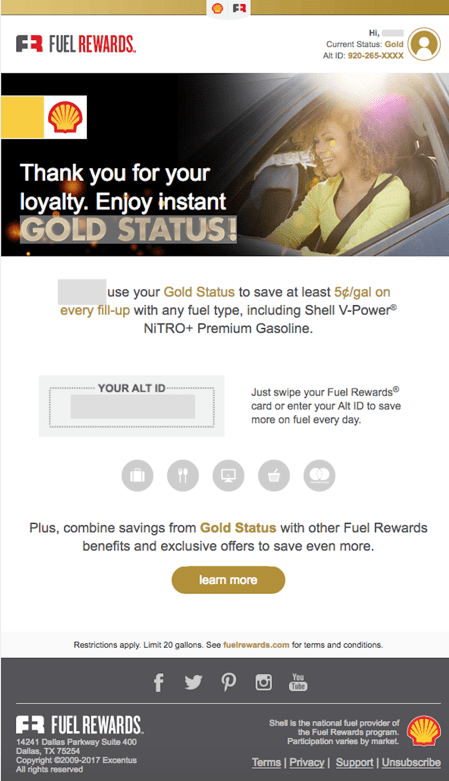 Shell thanks fuel rewards members with this loyalty message. Who they are: These customers are ghosting you. They no longer buy in time periods that match your customer lifecycle. They’re still in your subscriber database, your emails don’t bounce, but they register neither opens nor clicks. In which categories did they previously purchase? When did they purchase—during holidays, sales period, end of the month or at random? Did they purchase online or in-store even though they stopped opening and/or clicking on your emails? Are they fully unengaged with email and but just aren’t purchasing? 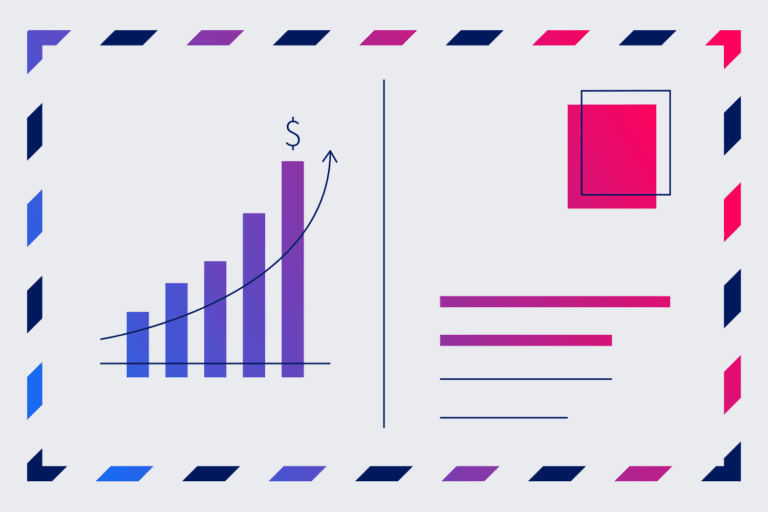 How to move them to act: Your actions will depend on whether they simply stopped engaging with your emails but continue to buy or have fallen off the radar completely—no purchases, no email activity, no bounced messages. Create an automated win-back program. Identify only those segments who are unengaged with your emails AND aren’t purchasing. Your win-back program must try to reactivate these lost customers. Although many brands attempt win-back programs, most lack creativity or pay attention to reasons why those customers went inactive. Most win-back programs rely on using discounts like smelling salts to revive dormant customers. Discounts can work (see our example at the end of this section), but they don’t have to be your first or only recourse. Be creative! Use what you know about your customers to see what works best for this segment. Review your emails and identify whether you’re addressing all four web personalities, as this is often a contributing reason as to why a subscriber tunes out from your emails. Next step: Test. No doubt a good percentage of your database falls into this segment. Use it to test your creative new approaches. Once you identify what works best, turn it into an automated program. Important! Do not include customer segments who still purchase but have not acted on your emails in this program. Email’s power as a branding channel to nudge customers to action is well documented. If they buy even without opening your emails, it’s a sign that just showing up in their inbox can nudge them to go to your site. Maybe your subject lines communicate the message value so clearly that they prompt customers to act. In that case, job done! After all, email is simply a vehicle to get your audience to your site. Success tip #1: Be customer-centric and helpful. Whatever approach you take, you’ll be more likely to win back customers if you show them how they can solve problems or achieve their goals by shopping with your brand. A constant stream of “we”-focused messages that say only “buy now” will turn off customers who aren’t in the market every time. Although a discount leads this Ann Taylor win-back email, we liked the “shopping with your girlfriends” emotion the copy evokes and the way the message wraps up some product recommendations as inspiration. Ann Taylor wins back customers with friendly & familiar messaging. Success tip #2: List the benefits of shopping with you. A little FOMO can’t hurt, right? This Saks Off 5th ad reminds email subscribers about the benefits they’re missing out on by not shopping. The prominent message is a clever twist on the usual “We miss you” copy, and the customer benefits are listed clearly underneath. The call to action for the “More!” loyalty program is written to prod customers into clicking the link. Saks Off 5th lists the benefits of shopping as a More! insider. Success tip #3: When in doubt, discount. This can be your “best and final” offer to entice customers back. If you use an automated series of emails, the discount message can be the last in your series. 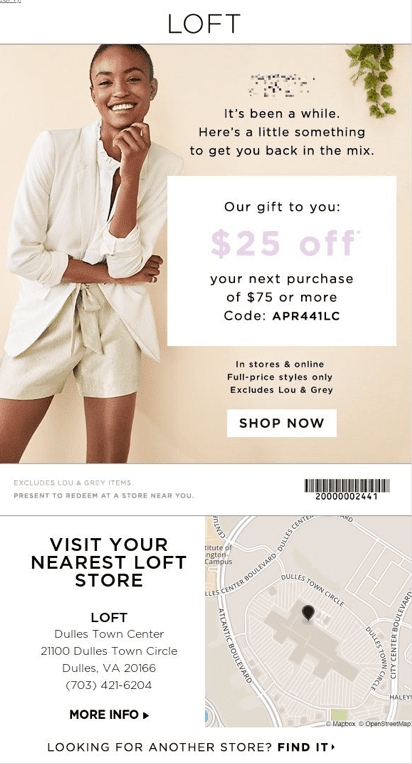 This email from LOFT combines both the discount and helpful content (geo-locating the nearest location to prompt an in-store visit, as well as an online purchase). LOFT integrates the online and offline experiences with this win-back campaign. Each of your customers is unique. But they share enough important characteristics with others that you can use to create specialized messaging that goes above and beyond even the best-made broadcast email. That’s the basis for database segmentation, but going beyond the basics of gender, location and preferences can uncover entire new and lucrative customer segments that are unique to your brand and can help you to achieve your business goals. Sit down soon with your database engineers, CRM wizards (or Iterable expert) and dig into your customer data to find those unique characteristics and create the segments that will support more meaningful messaging.